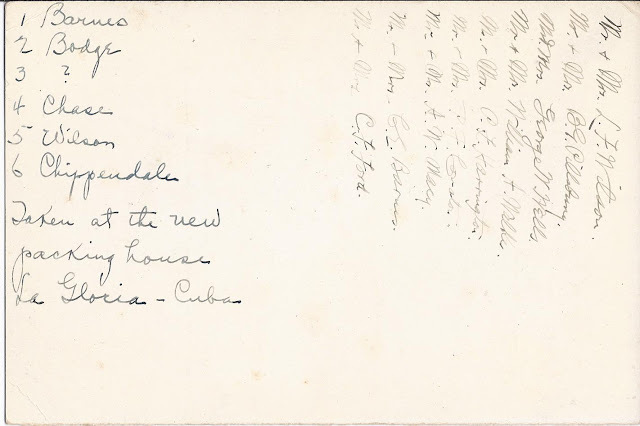 Memento of the Annual Dinner of the La Gloria Fruit Company at Young's Hotel, Boston, Massachusetts, 21 October 1916, with identifications of workers in the photograph of the "new packing house, La Gloria, Cuba, and a list of dinner attendees. Notice the numbers written in ink below the men in the photograph. 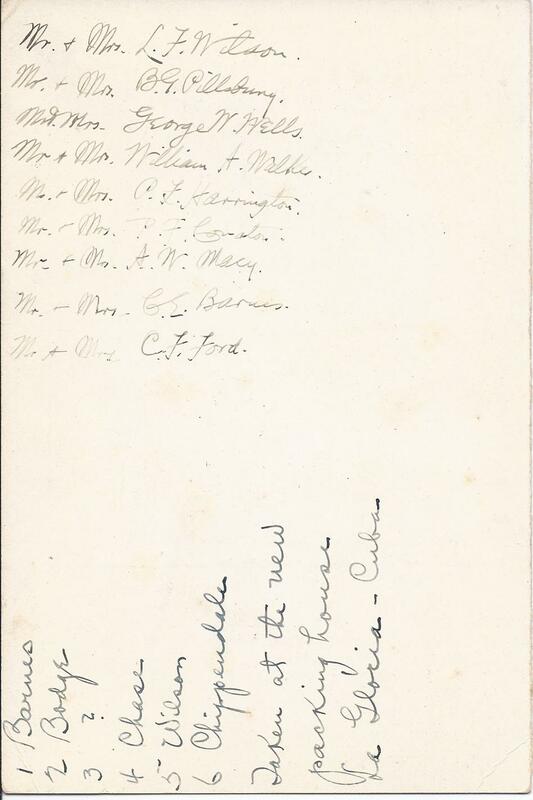 The numbered names above identify the surnames of those men. 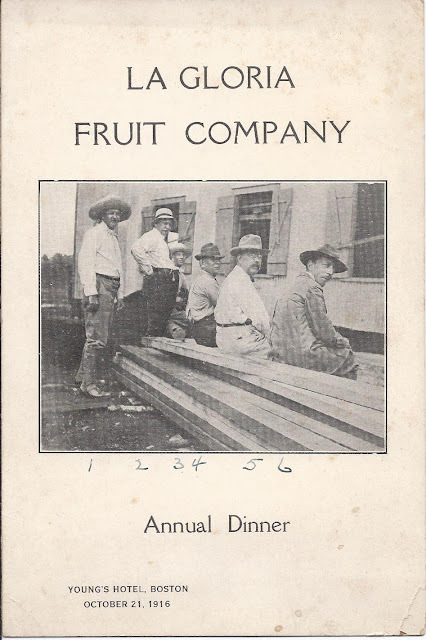 I'm assuming that the La Gloria Fruit Company arose from the La Gloria Colony in Cuba, which was founded in 1900 by settlers from the United States and Canada, with the backing of many non-resident investors. 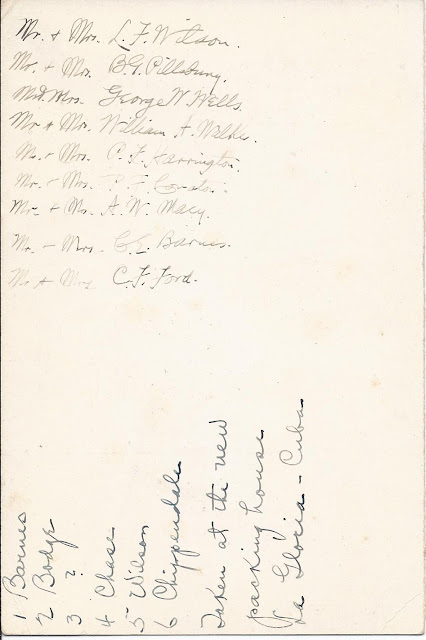 One of its founders was Lewis F. Wilson, who was likely the L. F. Wilson listed as one of the dinner attendees. He was born 13 November 1867 at Corning, New York, son of Benjamin Carr Wilson and Martha D. (Biles) Wilson. He married Martha H. Udall, born 27 September 1876 at Dubuque, Iowa, daughter of Charles E. and Frederika (Faulhaber) Udall, born in Vermont and Germany respectively. Lewis F. Wilson, in addition to being president of the Cuban Land and Steamship Company, which was involved with the La Gloria settlement, was a lawyer at New York City. 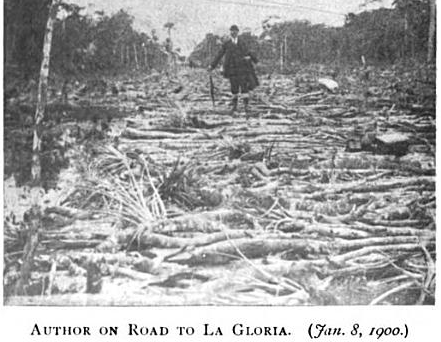 James Meade Adams wrote a book about the La Gloria settlement entitled Pioneering in Cuba: a narrative of the settlement of La Gloria, the first American colony in Cuba, and the early experiences of the pioneers, Rumford Press, 1901, when the outlook must have seemed still rosy, though it was a rough go at the start, as you can see from the photo below. By 1906, La Glorida had a population of 800 foreigners and 200 Cubans and a non-resident investor base of approximately 800. Just a few years later, however, La Gloria and similar operations founded by foreign investors, were in decline, due to economic, political and weather upheavals. If you have any insights into La Gloria, the La Gloria Fruit Company, or any of the people mentioned above, please leave a comment or contact me directly. Interesting! My great uncle J. J. Neustel was a member of the La Gloria Colony until his death in 1917. For more info on the Colony, see Enrique Cirules book "Conversations with the Last American". Thank you for mentioning this book - will put it on my list!